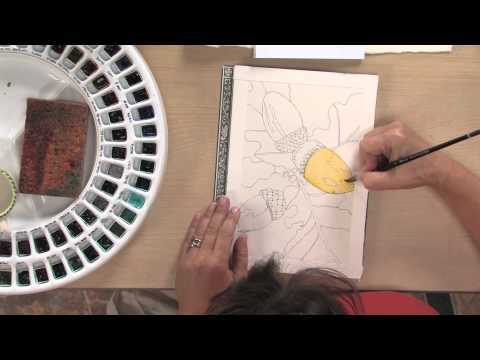 Watercolor painting and drawing have never been this easy! In this Digital Download, author, artist and experienced workshop leader, Gina Rossi Armfield shares some of her favorite art journaling techniques. She shares tips and tricks for creating drawings that not only fit your personal style, but that will encourage you to incorporate drawing into your daily life. You’ll learn contour drawing, blind contour drawing and sketching, all with the intention of incorporating it into your art journal. Then, Gina builds on those drawing techniques to show you how to adapt those images to watercolor work. She shares three watercolor projects that you can choose from based on how much time you have available for creativity that day. All of these techniques and adaptable projects are completed in your day planner art journal and are the perfect companion to her book, No Excuses Art Journaling (available Dec. 2013). In the end, you have no more excuses NOT to art journal! Preview Art Journaling with Gina Rossi Armfield The No Excuses Approach to Drawing and Watercolor here now!